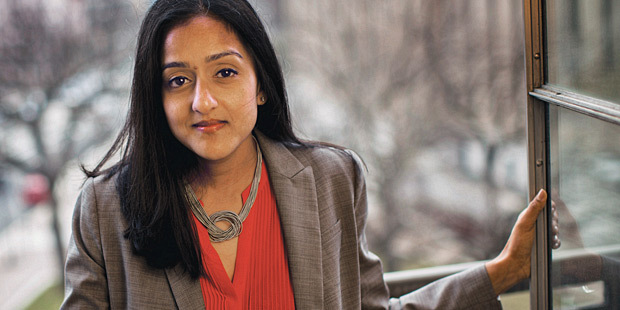 Pragmatic, politically sensitive, and known for finding common ground, Vanita Gupta ’01 has taken the nation’s top civil rights post in a time of turmoil. Vanita Gupta ’01 was appointed acting head of the US Department of Justice Civil Rights Division just two months after the fatal police shooting of Michael Brown in Ferguson, Missouri. Heated arguments and protests were raging across the nation about race, policing, and the criminal justice system, and DOJ investigations of the shooting and Ferguson’s police practices were already underway. Gupta had to hit the ground running. The Civil Rights Division had been without a chief for more than a year before she was tapped. Having worked for eight years at the American Civil Liberties Union, where most recently she led the Center for Justice, Gupta came armed with an impressive civil rights track record. Although Ferguson was but one of many items on the division’s agenda, it remained the focus of national attention. The investigation would telegraph the tone of Gupta’s potential leadership of the division that then-Attorney General Eric Holder called “the crown jewel” of the DOJ. Gupta’s ability to focus on the big picture is no surprise to her former boss Anthony Romero, executive director of the ACLU: “Vanita knows where true north is, how to navigate choppy water, and keeps her hands firmly on the tiller.” He points to an incident when Gupta’s decision to engage with the conservative American Legislative Exchange Council (ALEC) drew heavy fire from elements on the left, who lobbied the ACLU to cancel the meeting. “Vanita smiled and listened and said, ’I understand your concerns,’ but never wavered,” he says. She capitalized on ALEC’s interest in cost-cutting to get the group to sign on to an effort to reduce prison populations, which also served the left. Romero says Gupta “has the ability to see what’s possible long before the rest of us do.” He credits her with pioneering the ACLU’s National Campaign to End Mass Incarceration: “She started talking about the need for the campaign in 2009 before it was on the radar.” In 2013, Holder announced that the US would commit to reducing the prison population. Formative childhood experiences also influence Gupta’s work. The American-born daughter of Indian immigrants, she still remembers being menaced in London by skinheads shouting, “Pakis go home,” when she was four. “I was always aware whenever we went out if we were the only people of color,” she says. Her father urged her “to be aware, to ask questions, to read the news.” As a result, Gupta is mindful of the social, economic, and historic factors that affect the issues she deeply cares about.